A lot of people are beginning to understand just how a zero turn mower can transform their lives. After all, these mowers are easier to maneuver, cut mowing time, and use less gas than traditional riding mowers. These machines are also a whole lot of fun to ride and use. Anyone who doesn’t believe me should take one for a spin. The question that consumers should ask themselves isn’t whether or not they need one of these mowers but instead should be asking themselves how they can find the best zero turn mower available. A task I’m here to help them with by listing ten of the best zero turn mower models that are currently on the market. This mower is equipped with a powerful 22-horsepower Briggs & Stratton V-Twin Pro engine that delivers the power needed to get the mowing done quickly and easily. This mower has a 46-inch stamped reinforced deck, six height adjustments from 1.5-inches to 4-inches, a durable welded frame with caster wheels, a hydro gear EZT transmission, and an electric clutch blade engagement. It also has a 3.5-gallon fuel tank that holds plenty of fuel for just about any job. Other features which can be found on this device include an easy access panel, a 15-inch high back seat and a forward speed of up to 6 miles-per-hour. Designed to help homeowners get their mowing done in a timely fashion without a whole lot of fuss, the Ariens Zoom 34 has a number of features which make it a very good mower. It has a 34-inch cutting width that’s powered by a Kohler 6000-Series 19-HP 660cc engine. It also has a solid design that’s able to hand just about any terrain. This makes this an ideal mower for small to medium sized yards. Another thing worth mentioning about this particular zero-turn is that it’s less expensive than some of the other large mowers currently available. Although this mower is on the smaller size than many of the ZTR lawnmowers currently available, with only a 42-inch deck, it’s suitable for small to medium-sized yards and is capable of making short work of tough grass cutting assignments. This mower is powered by a Kohler 6600-Series 19-HP 660cc V-Twin Engine and has a durable deck which is made of 12-gauge steel. And since it can be adjusted to a cutting height between 1.5-inches to 4.5-inches, the rider can determine how short or how tall they want their grass to be. Other features on this riding mower include a foot-operated deck lift, a 4-point deck hanging system and a deck wash-out port for easy cleaning. This lawnmower has a number of features which make it a good mower for taking care of medium-sized lawns. For example, it has a 50-inch cutting width and a powerful Kohler 6000-Series 600cc 21-HP engine. It can be adjusted to a variety of different cutting heights from 1.5-inches to 4.5-inches, which allows the user, not the mower determine how long the grass should be. This model is considered by some lawn care enthusiasts to be one of the easiest to use models currently available. Other features found on it include a high-back padded seat, a deck wash-out port and a foot operated deck lift. With a design unlike most ZTR mowers, this unit is able to easily pull full 360-degree turns because of its low center of gravity. It features a powerful 24-HP Kawasaki FR730V engine and has a 54-inch cutting deck that has three Gator mulching blades. This mower also has a Hydro-Gear 2800 transmission, a rapid response control system and a forward speed of up to 8 miles-per-hour. Other features which can be found on this device include a heavy-duty welded steel frame, an 8-gallon fuel capacity and composite fenders with integrated storage. Equipped with a heavy-duty frame, a cutting deck made from twin sheets of 11-gauge steel and a 52-inch cutting width, this lawnmower is not only designed to be tough but to also get your grass cut as quickly as possible. It’s powered by a 25-HP Kohler engine and has durable 6-inch wide front caster which allows it to maneuver without tearing up turf. It’s also designed with the rider in mind and the user can make quick and easy adjustments while they’re seated in the operator’s seat. All of these features ensure that this entry-level commercial grade mower will get the job done. This mower has many of the features that people want out of a ZTR lawnmower. It has a 60-inch fabricated deck and a reinforced steel frame, so it not only has a nice cutting width but is also designed to stand up to wear-and-tear. This model also has a 25-HP Briggs & Stratton engine that provides more than enough power and drives this mower forward at a speed of up to 7 miles-per-hour. And since it has a PTO System, the blades can be engaged quickly. 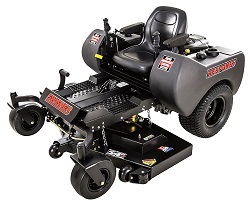 Other features which can be found on this mower include an 18-inch high-back seat and front caster wheels. Manufactured using a 25-HP Kohler 7000-Series Pro V-Twin Engine and a Hydro-Gear ZT 3100 trans-axle transmission that not only provides power but is also quite durable a well. This unit has a 25-gauge cast iron spindle deck, a welded steel frame and 6-deck wheels which allow it to go over just about any terrain. Other features which can be found on this unit include a forward speed of up to 8 miles-per-hour, 9-different cutting height, and a 6-gallon fuel capacity. These features mean that this mower is ideal for medium or large-sized yards and is durable enough for just about any lawn cutting task. This lawnmower has a 54-inch cutting deck that has 3 Gator mulching blades that can make short work of any lawn job and will allow the user to maintain a professional-looking lawn in no time flat. This mower has a 24-HP Briggs & Stratton engine with a Hydro-Gear 2800 transmission and has a top speed of 8 miles-per-hour. This model also has an 11-gauge fabricated deck, a welded steel frame and composite fenders with integrated storage as well. This unit is ideal for medium to large-sized yards and has an 8-gallon fuel capacity so it can go longer in between fill-ups than comparable models. This lawnmower has a number of features which make it ideal for just about any lawn cutting project. It features a powerful 23-HP Kawasaki motor, a cutting deck which is made from twin 11-gauge sheet steel and cast-iron blade spindles. This mower has a cutting width of 61-inches and a Hydro-Gear ZT3400 transmission which offer good ground speed all while operating smoothly. This model also has a roll-over protection system which protects the rider but can be lowered in areas that have low hanging branches. This unit also has a cup holder and arm rests as well.